Dora (based on Tennyson's poem) by Charles Reade. Dora was played by Kate Terry and Luke, in love with her, by John Billington. The scene is a wheat field in the setting sun. The new drama of domestic life, composed by Mr. Charles Reade partly out of the story told in Mr. Tennyson's touching and beautiful poem of "Dora," continues to attract good audiences at the Adelphi Theatre. 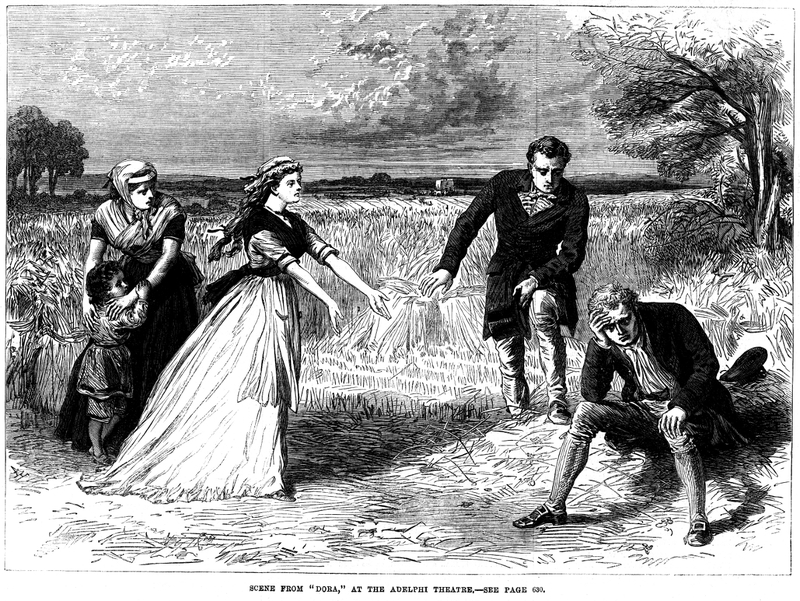 Our illustration represents the scene in Farmer Allan's wheat field at sunset, in the last act, where Dora has put William Allan's child in the grandfather's way, in order that she may intercede with the stern old man on behalf of the widow the orphan boy. The part of Dora, as our readers may remember, is played by Miss Kate Terry; that of the farmer by Mr. H. Neville; and Miss Hughes plays that of Mary, who has married William Allan, to the displeasure of his father, instead of marrying his cousin Dora. The other man is Luke Blomfield, a parsonage not to be found in Tennyson's poem, but invented by Mr. Reade for the purpose of counseling Dora for her rejection by William thereby, in our judgment, destroying half the moral interest of the original story. But of this we have spoken before. The part of Luke, which can scarcely be called a character, is performed by Mr. Billington.